The price is set only for departing from Heraklion city. For departures from other locations, please contact us for advising the price. The default stops may change according to your wishes, consult your driver. Entrance fees for archaeological sites/museums, escorts/guides and meals are not included. The Dikteon Cave (or Dikteon Andron or Dictaean Cave) is one of the most important and famous of the 3,000 caves in Crete and the 8,500 in Greece. 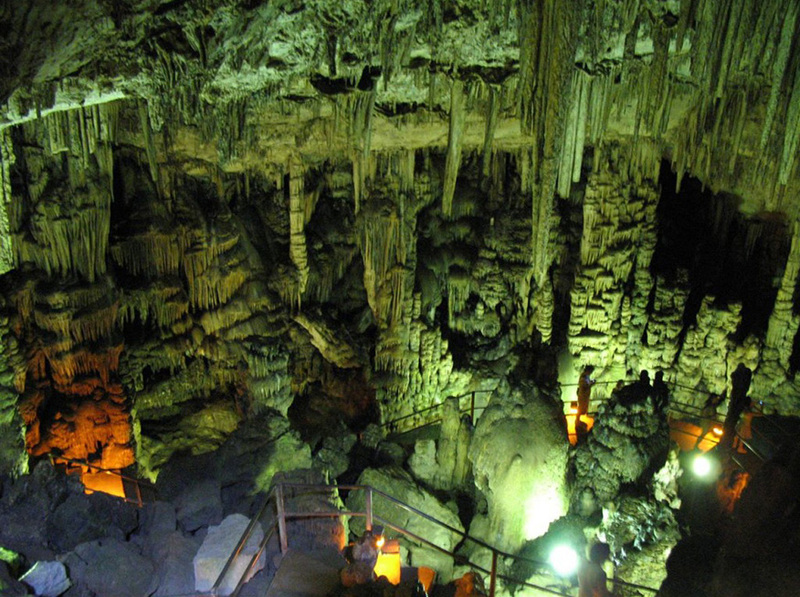 It is in the impressive Dikteon Cave, rich in stalagmites and stalactites, that Zeus was born according to legend. This is why the Dikteon Cave was already famous in antiquity, dedicated to the worship of the greatest of the gods, as the many offerings found there indicate. The Dikteon Cave lies at an altitude of 1025 m. on the northern slopes of Mount Dicte, which dominates the Lassithi Plateau and the whole of East Crete. The cave is near the village of Psychro, which is why it is also known as Psychro Cave. From Psychro, follow the paved path with oak trees on either side. For the more adventurous, at the beginning of the path you will find donkeys to take you up to the Dikteon Cave. At the end of the short path, just before the cave entrance, it is worth stopping to catch your breath, enjoy the panoramic view of the whole plateau and draw into your lungs the refreshing mountain air, scented with thyme, sage and other local aromatic herbs. It’s a wonderful feeling, making you think it was no accident that the Dikteon Cave was chosen as the site of such an important event as the birth of Zeus, Father of the Gods of Olympus. 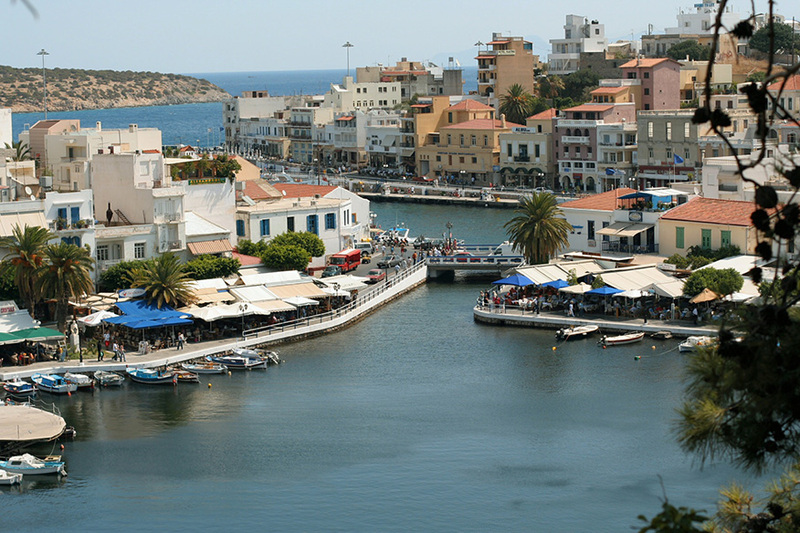 Agios Nikolaos, with over forty years of experience in the tourism industry, is an international and cosmopolitan resort that welcomes thousands of visitors annually. The lake is its most charming feature. Legend suggests that Athena and Armetis bathed in its waters. This lake is connected to the sea by a straight channel, while its natural surroundings of red rock and trees attract the visitor magnetically. At a small open-air theatre by the lake, locals and visitors alike can enjoy interesting artistic and cultural presentations. A walk around the shops of Agios Nikolaos is an enjoyable experience. In the many stores the visitor can find a wide selection of traditional Cretan artwork, copies of pieces from different archaeological museums, jewelry, and embroidery. There are also many examples of woven goods and Byzantine icons. Elounda is located in east Crete, north of Agios Nikolaos and south of the seaside resort of Plaka. 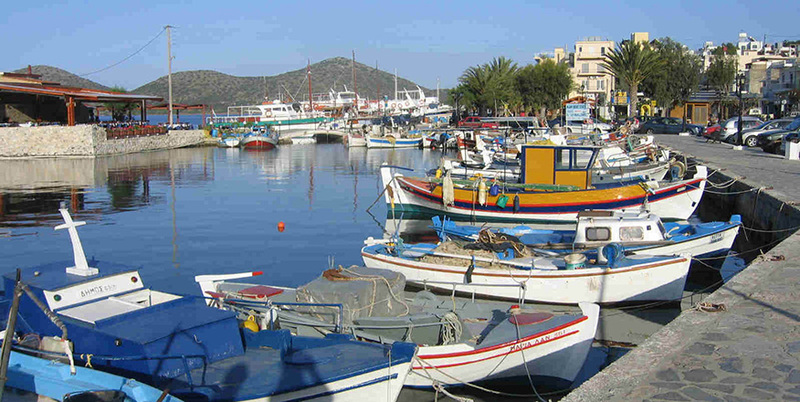 Elounda was once a picturesque fishing village in the lovely Mirabello Bay. The inhabitants lived from farming, fishing, salt extraction from the Venetian saltpans, and emery mining. In the hills around Elounda is found a mineral unique to Greece, “akonopetra” or whetstone, a type of fine emery used to make whetstones and emery paper to hone tools used in many different jobs. The emery of Elounda had long been known in Europe by the name of “Turkey stones” or “Naxos stone”. Once discovered by tourism, Elounda developed into a resort famous for its beautiful scenery and the luxury hotels which are still being built in the area. It is said to be the place with the most five-star hotels in Greece. "; //summaryPanel.innerHTML += "From " + route.legs[i].start_address + " to/strong> " + route.legs[i].end_address + "
"; //summaryPanel.innerHTML += "Distance: " + route.legs[i].distance.text + "
"; //summaryPanel.innerHTML += "Duration: " + route.legs[i].duration.text + "
LIMOBUS provides Luxury mini bus and limousine services throughout your travels on the island of Crete, Mykonos and Athens. For business or pleasure, we provide trained chauffeurs that will assist you during your excursion or transfer. Visit our Private Tours and choose the one of your preference. Other Private tours and Transfers can be arranged on request depending on your needs.